ePublishing Knowledge BaseePublishing Knowledge BaseePublishing Knowledge Base User Profiles and Registration FormsHow do I turn Buy It Again on or off? Since not all sites want to allow Buy It Again functionality, we've made it easy for you to turn this feature on and off. This feature is found on a reader's Past Orders tab under My Account / User Profile (https://www.yourdomain.com/user/profile#OrderHistory). 1. Where is this found on the User Profile's Past Order tab? The Buy It Again option is a new feature that, if enabled on your website, can be made available to your readers. It will show on a reader's Past Orders tab on their accounts. Zoom: Where is this found on the User Profile's Past Order tab? 1.1. Buy It Again turned off. Zoom: Buy It Again turned off. 2. Control this setting in your website's Admin by navigating to the following: Sys Admin > System Settings > Create & Edit. 3. Scroll down until you see user.profile.hide.buy.again. Zoom: Scroll down until you see user.profile.hide.buy.again. 5.1. 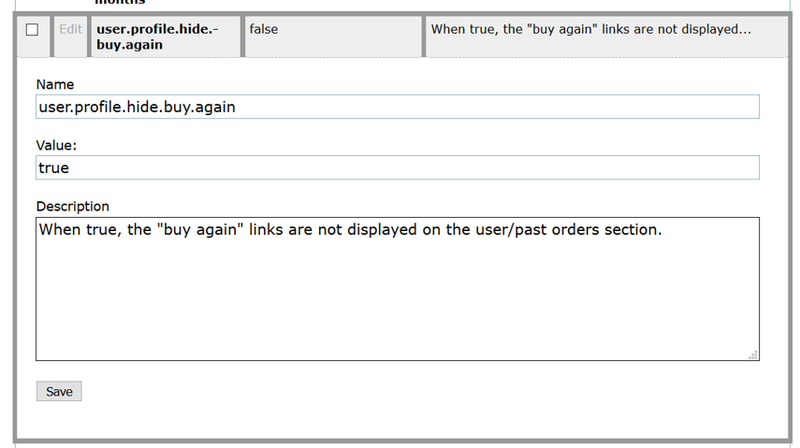 To turn the Buy It Again area OFF, type “true” in the Value field. Do NOT change any text in the Name and Description fields. Zoom: To turn the Buy It Again area OFF, type “true” in the Value field. 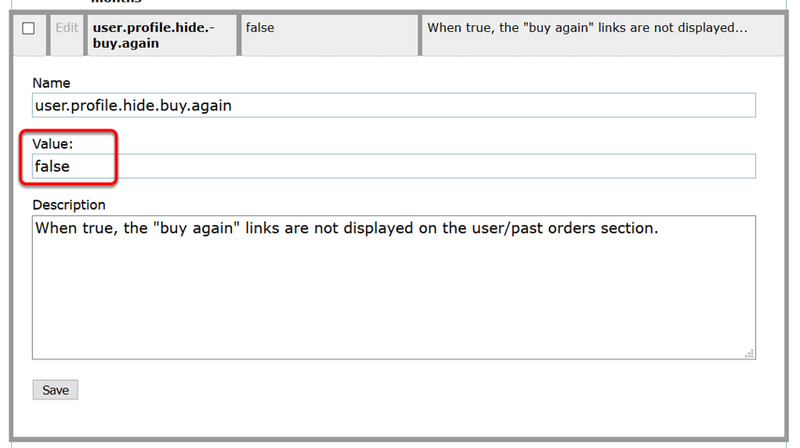 Prev: Why can't a reader see his payment information in his order history on our website? Next: How can a reader print an invoice for a past order?